Heat oven to 375°F. Gently scrub potatoes, but do not peel. Pierce potatoes several times with fork. Place on oven rack. Bake 1 hour to 1 hour 15 minutes or until tender when pierced in center with fork. Let stand until cool enough to handle. Meanwhile, in 12-inch skillet, cook bacon over medium heat 5 to 6 minutes, turning occasionally, until crisp; drain on paper towel. Cut each potato lengthwise in half; scoop out inside, leaving a thin shell. In medium bowl, mash potatoes, milk and butter with potato masher or electric mixer on low speed until no lumps remain (amount of milk needed will vary depending upon type of potato used). Stir in cheese, green onions and salt. 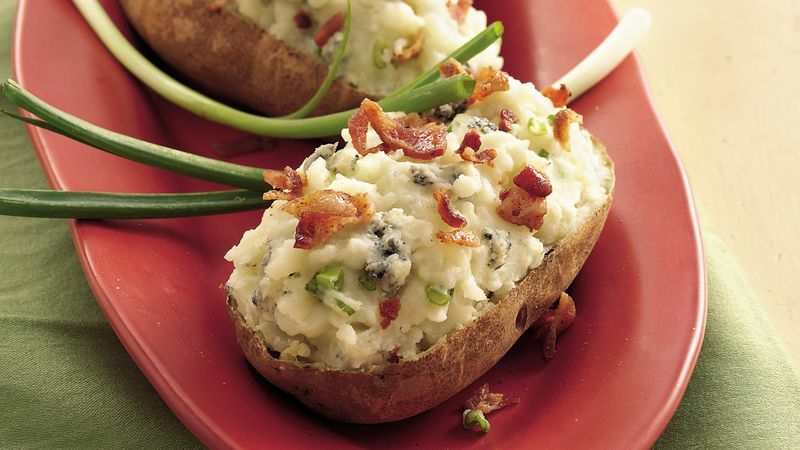 Fill potato shells with mashed potato mixture. Place on ungreased cookie sheet. Crumble bacon onto potatoes. Bake about 20 minutes or until hot. Garnish with additional sliced green onion tops if desired. A grapefruit spoon is super for scraping the potato from the shell. You can cut down the baking time for the potatoes to about 30 minutes if you microwave them first for 6 minutes before putting them in the oven. Assemble the potatoes up to 12 hours ahead, cover with plastic wrap or foil and put in the fridge. Then bake as directed in step 4.